I forgot to mention in my last post that I will ship these earrings anywhere, Europe, Australia, etc., so please feel free to enter. If you are unsure, send me a message. Don't forget the rules about leaving me a comment about how you are following me to get entered. I love my fans and followers and this is just the start of great giveaways that I have planned for the remainder of this year, so don't miss out. In other news, we are in the midst of remodeling my mother in laws bathroom and having the whole house painted and kitchen upgraded. Unless you have ever completed a project like this you have no idea of the headaches involved. I think we have changed our minds on the kitchen counter top 11 times and now we are back to our original idea of a solid surface counter top. We are leaving the nice Cherry wood cabinets, will replace the hardware, fix the cracks in the walls and paint and have already purchased a new stove and refrigerator to finish it out. In the bathroom, we are totally gutting it. 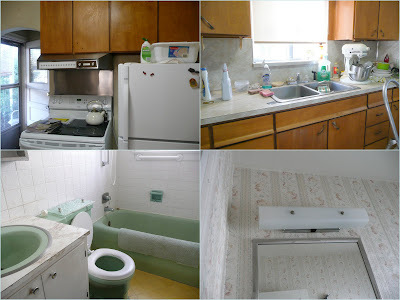 No more green tub, sink or toilet. The rest of the house will be painted, but the fireplace will get a new marble surround. We didn't want to go over the top with granite and high end appliances as we are planning on selling in the next year, but until then we will move my dad in to live for a bit until the market recovers. Here are some pictures of the before. I'll post after pics when it is completed.